Well, that didn’t take long. 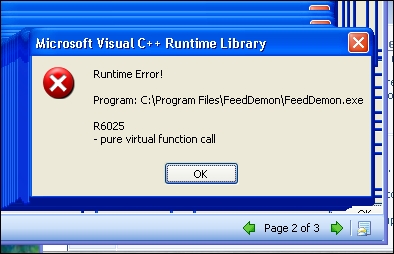 I have a reproducible crash bug in FeedDemon 2.6, already–what was that, in my first 10 minutes of use? I simply go to a folder that has more than 10 items in it, thus having more than one “page” in the newspaper view. I read some items, hit Ctrl-D to go to the next page, then Ctrl-M to mark the items as read, then I get the error popup you see in the screenshot above. I’ve restarted FeedDemon several times and each time I can reproduce the crash with the same exact steps. I hope FeedDemon 2.6.1 isn’t too far away from being released. And, I hope it includes a fix for this crash bug.